Please note that all the source codes are provided "as-is". For further support or modification, please contact Terasic Support and your request will be transferred to Terasic Design Service. More resources about IP and Dev. Kit are available on Intel User Forums. 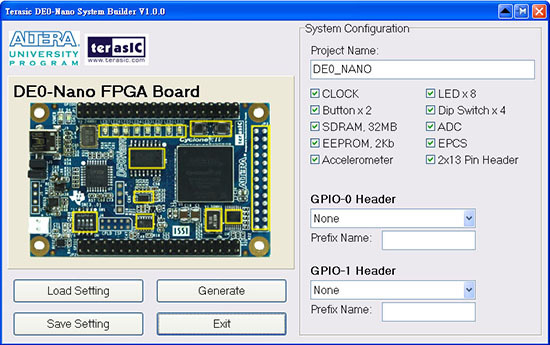 Allows users to access various components on the DE0-Nano board from a host computer. This tool will allow users to create a Quartus II project on their custom design for the DE0-Nano board with the top-level design file, pin assignments, and I/O standard settings automatically generated.